Australians invented the lawn mower, rotary clothes hoists, plastic bank notes, WiFi, the electric drill, and five of the six harvest weed seed control (HWSC) techniques. And while the Canadians invented the chaff cart (to feed livestock) it was Australian farmers and researchers who started using it for HWSC. So we’re going to claim HWSC as a true blue Aussie invention too! We are the inventors of some of the key tools of HWSC and a recent GRDC grower survey has shown that we are by far the world leaders in the adoption of these practices. Not so long ago harvest weed seed control (HWSC) was only used by a minority of early adopting grain growers, now it has gone mainstream and pretty soon just about everyone will be doing it. Every few years GRDC fund a large grower practices telephone survey. The most recent survey was conducted by CSIRO in 2014, and they collaborated with Michael Walsh who at the time managed the HWSC program at AHRI (now at University of Sydney) to design the HWSC questions. Michael has now reported on the results in a recent scientific publication. The survey revealed 43% of Australian grain growers are currently practising HWSC and this is set to double within the next five years. 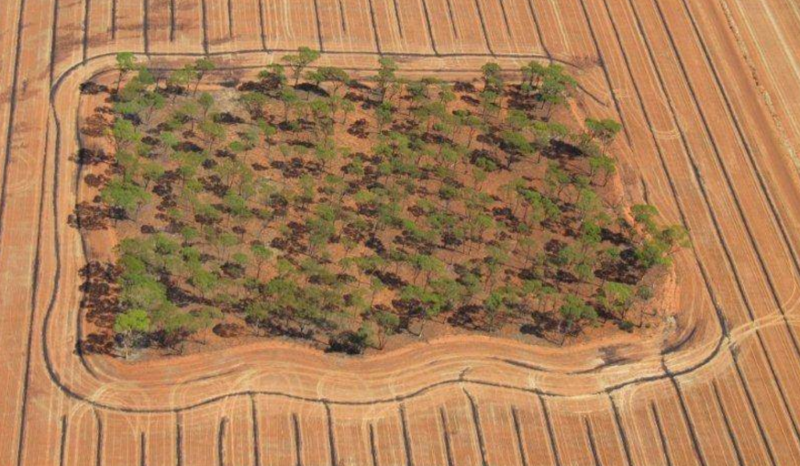 Narrow windrow burning is currently the most commonly used practice, with 30% of growers adopting this approach. While its popularity is booming now and probably will stay that way for the next five years, Michael says it’s unlikely to remain the frontrunner in the future. 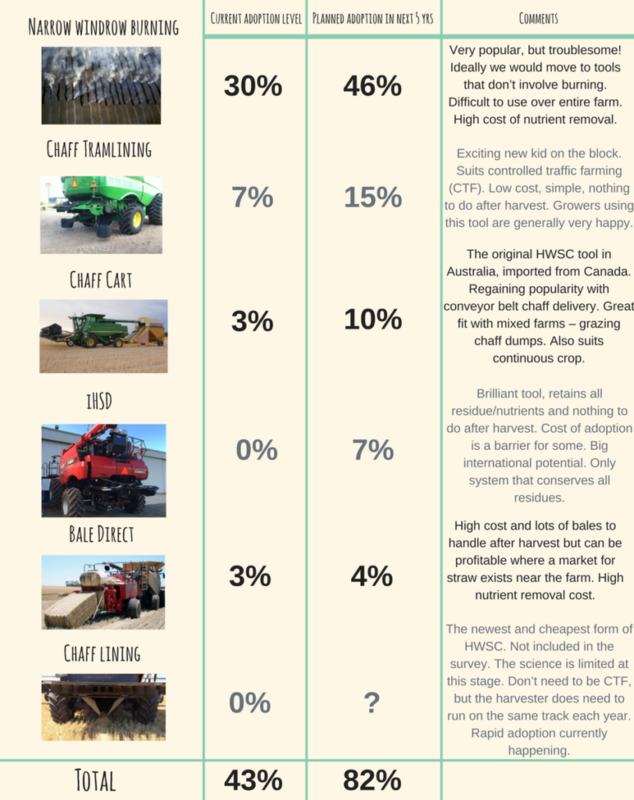 With new innovations popping up, it’s tricky to know what will be the most popular tool in the future, especially given there are some new kids on the HWSC block that are currently being taken up by Australian grain growers, namely chaff tramlining and the integrated Harrington Seed Destructor (iHSD). It will be interesting to see where they sit in five years time. It took 30 years to get to 43% adoption, so it is an interesting result that this could double in the next five years. To find out what tools are being used and where, continue reading. There were 602 grain growers from all over Australia who participated in the survey, representing a total arable area of 2 million hectares were surveyed by phone in 2014. 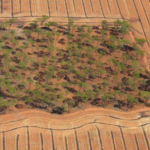 The survey was funded by GRDC and conducted by CSIRO. It focused on a wide range of farming practices, one of which was harvest weed seed control. The completion rate for the survey was 44%, so a big thank you to all of those growers who took part. As you will see, this survey really helps us to work out where to focus our efforts in the future. The table below sums up the key results. There’s nothing like a bit of interstate rivalry to up the stakes a little. Western Australia is leading the charge with 63% of growers using HWSC, followed by the south-east cropping region (SA, Vic, Southern NSW) at 39% and 19% in the north-east of Australia (Nth NSW and Qld). There is no definitive survey of HWSC adoption by the world’s farmers, but we know that the use of these practices is extremely rare in other countries. Approximately 25 southern USA grain growers used narrow windrow burning in 2016 and this is considered to be the start of this practice in the US. It seems crazy to spend all year and a lot of money spraying herbicides on a crop only to spread the seeds of the survivors evenly over the field at harvest so you have something to spray next year. Australian grain growers are well aware that seed retention of our main weeds is their Achilles heel and as such have adopted harvest weed seed control. In general, our cropping area is increasing and most of our crops have fewer weeds than ever, despite alarming levels of herbicide resistance. We are having a win, and a large part of this success is the adoption of harvest weed seed control.